Is your front or back lawn damaged beyond repair? Andrew Roy Lawn Mowing are here to help, with our expert instant turf solutions, guaranteed to give you a lovely green lawn that lasts. Our instant turf is grown right here in Australia from the highest quality of grass strains. Your new turf, installed by us, not only brings back your garden’s beauty, but it will also be fitted correctly the first time round. 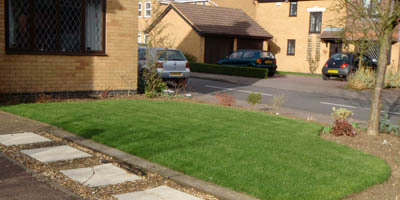 In conjunction with our instant turf laying, we can also maintain your new lawn with our tailored services for residential and commercial lawn mowing. Our instant turf team are the leading experts in their field, and will be able to suggest to you whether instant turf will benefit your property. You can call us on 0418 399 793 for further enquiries regarding our instant turf, or to simply obtain a free, no obligation quote. Our instant turf can bring your garden back to life, so don’t delay, contact us today, and let us rejuvenate the appearance of your property with our easy lawn solutions.